On a happy vibe with Capiche for this lovely Tuesday post. I don't know much about Capiche, but it's obvious to me that their influences lie some where between Ray Parker Jr. and George Benson. It's soft rhythmical vocal sweetness. For the record, this is not the same Roy Hamilton known as the golden boy of song, as he passed away in 1969. This heater from 1984 is on the HBS label. Again, I know little to nothing about the label or this artist, just that it's really good. The phrase 'Nice One Big Dave' on the label is a reference to Dave McAleer, who was among many things a mogul of the British music scene. 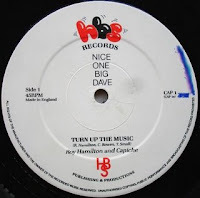 Dave was also one the UK's first club Deejays and oddly enough became the manger for The Rah Band.